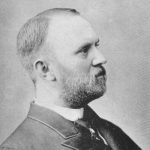 Dr. George John “Ainley” Thompson was born near Harbour Grace, Newfoundland on the 09th of May, 1861. He was the 4th of 6 children born to William Henry Thompson and the former Mary Elizabeth Davis. His siblings were Amelia Jane, Eugene, William, Victoria (who died in 1877 at the age of 14) and Frederick. 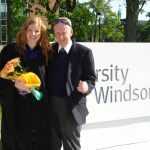 Dr. Thompson graduated B.A. in 1885 and M.A. in 1888 from McGill University. Dr. Thompson became a Presbyterian Minister. 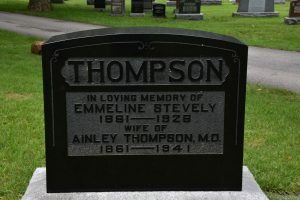 On the 26th of March,1889 Dr. Thompson married Emmeline “Emma” Stevely at the home of the bride in London, Ontario. Mrs. Thompson was born on the 10th of March, 1861, the 3rd of 9 children born to William Stevely and the former Elizabeth Shepherd. Her siblings were Jane, Pemlia, John, Samuel, Elizabeth, William, Alma and Lena. According to the 1871 census the Stevely family lived in Wardsville and her father worked as a tinsmith. In 1881, the Stevely family lived in London, Ontario and Mr. Stevely was a merchant. After their marriage Dr. and Mrs. Thompson lived in London Twp., Ontario. Their first child, William Stevely Thompson was born in London Twp on the 25th of June, 1890. Their second son, Ainley “Stewart” Thompson was born on the 29th of May, 1892 in Aylmer, Ontario. A third son, John Gordon Thompson was also born in Aylmer on the 2nd of January, 1894. In 1907, Dr. Thompson graduated M.D. from The University of Toronto Faculty of Medicine. He opened a medical practice in Chatham. In 1911, Dr. and Mrs. Thompson and their sons, resided at 339 Princess Street in London, Ontario. In 1914 the Thompson family lived at 156 Elmwood Ave., in London. Mrs. Thompson died on the 2nd of August, 1926, at St. Joseph’s Hospital in London. She was buried at Woodland Cemetery in London. Dr. Thompson married Annette Frances (Fletcher) Carpenter on the 29th of December, 1928 in Jefferson, New York. She was born on the 10th of October, 1872 in the state of Delaware. Her parents were Frank Alfonzo Fletcher and Ida Ann LaDue and she had an older sister named Flora. Mrs. Thompson had been married to John M. Carpenter. In 1910 John and Annette Carpenter and their 8 year-old son Robert Fletcher Carpenter resided in Watertown, N.Y. John Carpenter (son of John M. Carpenter Sr. and Jane Amanda Graves) died in 1918 and he was buried at Brookside Cemetery in Watertown. Dr. Thompson died in Pinellas County, Florida in 1941. He was buried next to his first wife at Woodland Cemetery. 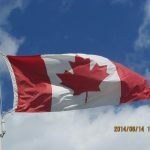 Mrs. Annette Thompson died in 1942 and she was laid to rest, next to her first husband at the Brookside Cemetery in Watertown, N.Y.
*Dr. Thompson’s sons Ainley Stewart Thompson and John Gordon Thompson served with the Canadian Army during WWI. **Dr. Thompson’s son Col. John Gordon Thompson (1894-1982) and his wife Essie Kathleen McCreery and also buried in the family plot near Dr. and Mrs. Thompson. A separate tombstone in the family plot, is that of the daughter of Col John Gordon Thompson and his wife Essie. Their daughter, Catherine Emmeline Thompson died on the 11th of June, 1927 at the age of 3 years and 3 mos.